We can mitigate these problems by introducing the building cooperative approach to NZ. This system brings groups of people together to design accommodation that meets their needs. The group then funds the project and commissions service providers to undertake the work. It allows people design their home to fit their own needs. This approach is more sustainable and cheaper than the developer led method because they reduce redundant features built for the general market, reduce the risk that a project won't find an end user, and promote sharing of facilities which are usually private such as a laundry room or a guest room. Sadly, this model has been slow to spread, because it is hard to find groups of like-minded people, time-consuming to obtain the relevant information, and difficult to convince lenders and service providers who are unfamiliar with this approach. Without some form of intervention this model may not emerge in NZ. We aim to promote the building cooperative approach by providing an online platform to match like-minded people, share information, and engage lenders and service providers. This will mitigate climate change by reducing household energy and resource consumption, by reducing transport emissions, and by enabling efficient investment in energy saving and generating technologies. In the long run, this could reduce NZ’s emissions by ~4% of current levels. It has the potential to do much more when rolled out globally. At the same time, it will generate social benefits such as healthier, more resilient communities. New Zealand’s real estate market is failing to meet the needs of New Zealanders. As a result, we have looked at sustainable building approaches internationally to see if there were any that offered promise. One that stood out is a model of sustainable building that started in Germany and has begun to spread through Europe. This model is centered around future owner-occupiers coming together to form building cooperatives (called Baugruppen in German), which oversee the design and development of a set of homes for the cooperative’s members. These homes can be either new builds or an existing building can be retrofit. This approach differs from other cohousing models because while it promotes a sense of community and an explicit consideration of investing in shared spaces, once the building is complete, each cooperative member takes ownership of their individual dwelling. This means that building cooperative members are not locked into the community forever if things do not work out. Third, because residents are designing these buildings for themselves they can cut out things they do not want. Real estate developers often continue to build features that were considered highly desirable in the past but which have begun to become redundant due to changes in lifestyle. One example of this is parking spaces. There is a view that all high-end city apartments require a parking space despite the fact that it is becoming less common for young professionals to own a car. Buildings constructed under the building cooperative model tend to be medium scale residential (i.e. small apartment buildings) and place a significant emphasis on creating a social and friendly atmosphere between their residents. They have plenty of inviting shared spaces and are often strategically placed to access public transport, thus providing their residents with the opportunity to live a car-free lifestyle. This model has been successfully introduced in a number of European cities, particularly Berlin, Freiburg and Hamburg. Uptake has been growing rapidly. In Berlin, for example, ten percent of new builds already utilised this model in 2011. (7) However, it has been slow to spread beyond Central and Northern Europe. The difficulty in convincing service providers (especially lenders) of the viability of the model. These issues were also cited as key difficulties in getting projects off the ground in Germany when the model was first introduced. Many of the people we talked to about the model said that it sounded attractive but they would only do it with a group that they trusted. Similarly, two of the groups that were actively trying to form a building cooperative had lost members because these members did not agree with the group’s vision or lacked the financial resources to participate. This cost these groups time and money and put their projects at risk. People also found it time-consuming to gather information about undertaking a building cooperative. One group said that they had wasted six months simply because they did not know the appropriate order to do things in. Also, groups often have to reinvent the wheel when it comes to things like legal structure because they cannot find out what earlier groups have done. Furthermore, even when information can be gathered, it is sometimes conflicting as different suppliers use different measures to promote their approach/product. Finally, groups have found that some of the parties they have to interact with are not used to or are not well equipped to deal with building cooperatives because this model is uncommon and not widely understood in New Zealand. Banks are a particular problem in New Zealand as building cooperatives do not fit into their traditional lending models. Our initial discussion with a lending specialist suggested that banks are unwilling to spend time looking into this model for the sake of a loan to a single project, but that they might be more interested if they believed that the market would rapidly grow. 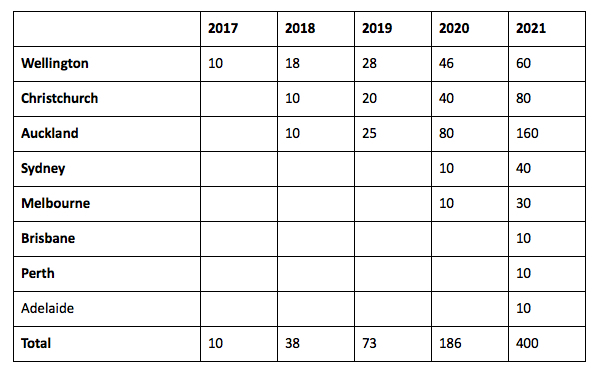 If they were to offer these loans in the future they would likely require a specific range of information, for example about the governance structure of the group, the group’s goals and potentially information about the group’s likelihood to succeed. Help people form groups by matching people with similar interests and complementary skill sets together. This will mean that people looking for a group will be able to find them much quicker. Further, because over time, we will begin to learn more and more about what makes groups successful, we will be able to focus on these issues by having the platform ask users about them specifically. This should lead the groups that are formed through the platform to be more successful. Provide these groups with an online decision making tool that offers curated information about best practice and the pros and cons of various decisions. This should make it easier to solve time-critical issues and make minor decisions online rather than being reliant on convening a meeting in person (though in person meetings would still be recommended for most decision making). It should also drastically reduce the time and effort that groups have to put into finding the necessary information to make decisions. Where many groups face the same problem which can be solved with a general solution (e.g. legal structures), we propose to invest in developing solutions to these issues. Provide a tool to share design decisions, along with information about the group, with service providers like banks and architects. Coupled with this, we will actively engage with lenders and service providers to help them understand the building cooperative model and to encourage them to support it. The way it will work in practice is that interested individuals will sign up to Kaenga and will be asked to take a survey about their skills, financial situation and what they are looking for in a home and neighbourhood. Based on this data, the system will propose groups and individuals that the person is a good match for. Once the group has reached an appropriate size, Kaenga staff will arrange a meeting so group members can get to know each other in person. After this, the system will ask its members to commit to the group. If enough of the members do, they will make a small deposit and go through credit checks to ensure that they have sufficient funds. Next, Kaenga will take the group through the process on a step-by-step basis, showing them what decisions and actions they need to take and the order in which they have to take them. For each decision, objective information about best practice and/or the pros and cons of each option will be displayed. While the system will not force groups to build in the most sustainable way, it will structure the choice architecture in a way that promotes positive social impacts (in particular sustainability). This may involve, for example, choosing to display the most sustainable option more prominently than other options or even displaying it as the default option (which groups would be free to opt out of). Behavioral economics suggests that subtle changes like these can have a very large impact on people's choices. (8) Finally, when the group needs to engage a service provider, they will be able to place a request for bids with a number of relevant suppliers with the click of a button. Kaenga’s core focus will be on using technology to capture information and transferring it to those who need it in the simplest and most understandable form possible. Kaenga is not designed to take the place of service providers, as this would be too capital intensive. Therefore, in almost all cases, Kaenga’s role will be to steer people towards service providers rather than providing the service itself. However, Kaenga will actively consider how to best present this information to lenders and other service providers and actively work with them to remove barriers. 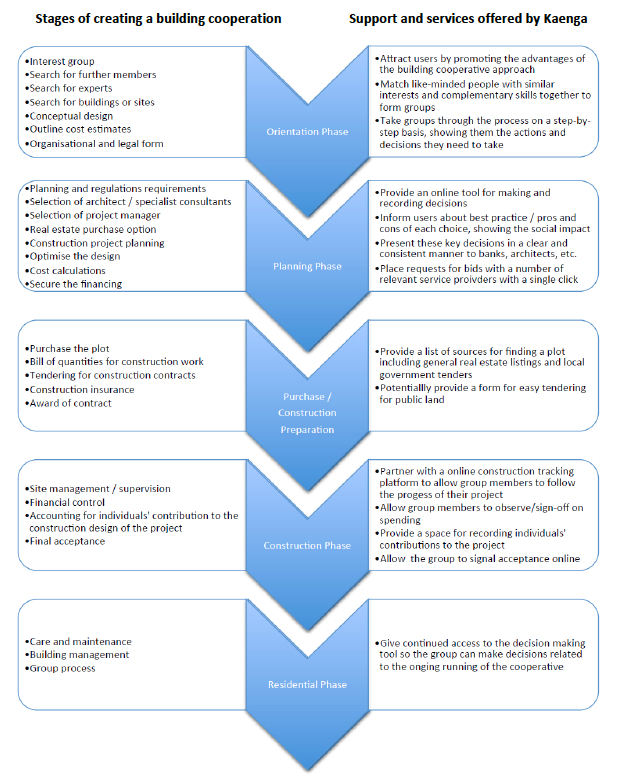 The table below shows the phases of creating a building cooperation and the services offered by Kaenga. As the judges have pointed out, in order for this project to succeed, we will need the support of a number of stakeholders, in particular, individuals who will participate in the building cooperatives and financiers. This is consistent with our experience to date and we have begun to address these issues. We have started to engage with potential future users through a meetup series on meetup.com. We are also looking at the possibility of running an exhibition, conference or symposium, to raise awareness of the idea and to promote stakeholder engagement. Furthermore, we have approached the Wellington City Council, architects and engineers about collaborating on a pilot project to provide a proof of concept. We propose to undertake the platform build ourselves but we will require support from central and local government, bankers, builders and architects, investors, and future home owners in order to succeed. Government will play an important role in removing regulatory obstacles and potentially providing financial and in-kind support. Banks will be needed to provide loans to the projects (on commercial terms). Builders and architects will be needed for their expertise in building housing. Investors will be needed to support the initial costs of Kaenga. And future home owners will be needed as they are the primary customers of this system. We plan to initially roll out the project in Wellington. If this is successful, we aim to expand to Auckland, Australia, and the world. While these factors make Wellington an attractive location to launch Kaenga, many other cities are facing similar issues. For example, Auckland is facing an even larger housing shortage (24,000) and a stronger growth rate (2.4%). (15) It is also trying to encourage more medium density development (in fact, our preliminary research suggests that the aim of promoting well-designed, medium density development is prevalent amongst city councils around the world). It is also worth noting that a number of countries have lending institutions with a mandate to lend to sustainable projects. For example, the Green Investment Bank in the UK has this mandate and in the US, Fannie Mae has recently announced an interest rate discount for green multi-family dwellings. (16) This should mean that getting access to funding may be significantly easier than in New Zealand. Kaenga will help to mitigate climate change by creating more energy-efficient homes and by helping to reduce transport emissions through increasing urban densification promoting the use of public transport. Sustainable technology has been able to reduce emissions by 50%, (17) so we believe this is a reasonable estimate of the emission reductions we could achieve. We also assume that household commutes will decrease from 20 to 10 km and 3/4 of residents will swap from commuting by car to public transport. This will lead a single household to reduce yearly CO2e emissions by 760 kgs in a given year, and 38 tonnes over the building’s lifetime. In our 5th year, we will generate 285 metric tonnes of annual emission reductions and 12 Mt CO2e of lifetime emissions. It isn't feasible to accurately quantify global impact, but if rolled out internationally, it could significantly reduce the 10% of emissions from residential dwellings and the 10% from transport. Kaenga will improve access to affordable and warm housing. This will alleviate poverty and improve health outcomes. Cooperative builds in Germany have been able to achieve a range of other benefits. They generate a strong sense of community and promote more active lifestyles by being strategically located in walking or biking range of amenities. In addition, multi-generational housing allows members to support each other where they are best able. For example, time rich senior citizens provide childcare for young families and in return, have someone watching out for them if something goes wrong. Similarly, ethnically diverse housing helps immigrants to integrate while enriching locals’ lives by exposing them to other cultures. Finally, communities that form around a particular objective, such as living more sustainably, are able to do this better. We believe that the same sort of impacts can be achieved in New Zealand and we aim to actively promote them. We estimate that the cost of building a platform will be roughly US$200,000 and that the cost of providing a legal template in New Zealand will be around $70,000. We expect that there will be some additional costs to expand this platform internationally: programming cost will be relatively low for each new region (i.e. between $50,000 and $100,000) but the cost of developing a legal template is not likely to decrease by as much (and may even be more expensive in cases where regulations are more burdensome than in New Zealand). Rather than building a fully automated platform before launching, we will build the platform slowly over a series of phases. Initially, we will manually perform many of the services that will ultimately be automated. For example, the first version of the matching service we will provide will involve us matching people manually. This will allow us to deploy quickly and cheaply, and to co-design the platform with our early users. Research and Design (3 months): Team members continue to work on the project on a part-time basis while initial customers are recruited. Initial Rollout (6 months): The platform is launched with an initial user group based in Wellington. The minimum viable product is built and populated as we figure out what the group needs. Costs are kept to a minimum. National Rollout (18 months): Three more user groups are added, one in Auckland, one in Christchurch and a second one in Wellington. Groups continue to work with staff to develop the platform and make sure it suits their needs. The first project is completed at the end of this period. International Rollout: With proof of concept in hand, Kaenga raises a second round of capital and pursues an aggressive rollout in Australia. The platform is adjusted for national differences, staff are hired in the new location or staff are relocated and their positions are backfilled. The proof of concept also unlocks significant demand which had previously been waiting to see whether this model would work. Consistent with these timelines, we project the following uptake rate. (1) Pure Advantage (2012) “Green Growth: Opportunities for New Zealand”, pp. 215-217. (2) Finch Ratings (2016) “Global Housing and Mortgage Outlook”. 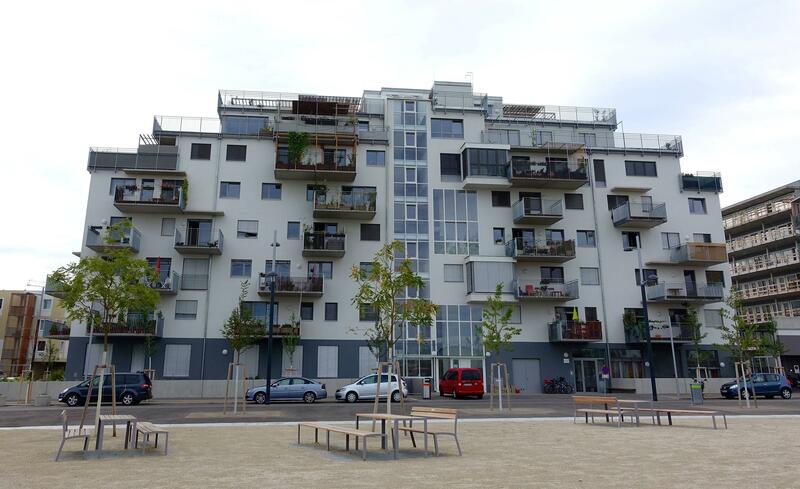 (3) STATTBAU GmbH (2015) “Living in a Community: From the idea to a joint home” (http://www.stadtentwicklung.berlin.de/wohnen/wohnungsbau/download/wohnen_in_gemeinschaft.pdf), p. 7. (4) Baugruppe Czech (2016) “Baugruppe Handbook: (http://baugruppe.cz/assets/bau_manual_online_en.pdf), p. 8. (5) For example, one study found it was only 2% more expensive to build a green building (Kats, Greg, Leon Alevantis, Adam Berman, Evan Mills, Jeff Perlman (2008) “The Cost and Financial Benefits of Green Buildings”). (6) Some might object that the building cooperative approach is merely generating saving by having members of the cooperative take on risk. However, this is not the case since this approach actually reduces two of the largest causes of risk: that the market falls during the construction of the development; and that the market will not appreciate the design/location/attributes of the particular development. The first risk is reduced because the owner-occupiers who are members of these groups typically do not intend to sell their properties in the short run and therefore only have to worry about price movements in the long run (where risk is significantly decreased). The second is eliminated because the buyers are designing the building for themselves. (7) STATTBAU GmbH (2015) “Living in a Community: From the idea to a joint home” (http://www.stadtentwicklung.berlin.de/wohnen/wohnungsbau/download/wohnen_in_gemeinschaft.pdf), p. 7. (8) See for example, Thaler and Sunstein (2008) "Nudge: Improving Decisions about Health, Welfare, and Happiness". (11) The Property Group (2015) "Housing Pressures in Wellington: Issues and Options for Wellington City Council", p. 10. (13) The Property Group (2014) "Wellington City Housing and Residential Growth Study: Final Planning Assessment and Recommendations", p. 9. (14) The Property Group (2014) "Wellington City Housing and Residential Growth Study: Final Planning Assessment and Recommendations", p. 72. (17) Pure Advantage (2012) “Green Growth: Opportunities for New Zealand”(http://pureadvantage.org/wp-content/uploads/2015/04/PURE-Advantage-the-full-report.pdf), p. 224.